The 58-year-old actress has made a career out of playing dark, alluring characters — none more terrifying than her latest on HBO’s Sharp Objects. “I call this my Streetcar Named Desire staircase,” Patricia Clarkson says on a balmy day at the end of June, addressing the inky-black, iron-wrought staircase cascading around us, when I visit her at her apartment in New York. Clarkson has been living here for 11 years, but it speaks to a history far older than that; much of it betrays her New Orleans upbringing. The eight-foot shutters adorning the windows in the front room. A wall chandelier gifted by a good friend. A fleur-de-lis tray holding small glasses on her coffee table. The soft navy carpet in her bedroom. Each room evokes the understated decadence her hometown is known for. It’s also filled with markers of her long career as an actress. A beautiful Schwinn bike leans against a nook in her hallway that has floral decals along its body and a leopard print seat. “You want to know who gave me this? One of dreamiest directors I’ve ever worked with. George Clooney,” she says with a coy smile, pointing out her character’s name from his 2005 directorial work, Good Night, and Good Luck, printed on its side. “It’s really way too heavy. I rode it when I dated a man who lived in the country, but I would never ride it in New York City,” she adds, before moving to her bedroom. Clarkson moves with a calm, warm confidence as she points out beloved aspects of her home, but what’s most striking about her is clear the longer you’re around her: Here is a woman who carries a sense of history in her every step. Onscreen, this is perhaps nowhere more evident than in her latest role in HBO’s limited, southern-gothic series, Sharp Objects. “I haven’t walked this line since Blanche,” she says over a glass of rosé, referring to the infamous Tennessee Williams creation Blanche DuBois, whom she played in a 2004 staging of A Streetcar Named Desire. Blanche is a continued presence in our conversation about Sharp Objects. Based on Gillian Flynn’s first novel of the same name, it’s the kind of splashy, A-list series HBO has become increasingly adept at nurturing. Coming off the success of Big Little Lies, Jean-Marc Vallée acts as the series’s director. Marti Noxon and Gillian Flynn, among other writers, pen episodes. The knotted tale centers on Amy Adams as Camille Preaker, a low-rate, alcoholic journalist riddled with emotional and physical scars, who is thrust back into her rural Missouri hometown, Wind Gap, in order to write a story about a serial killer targeting young girls. 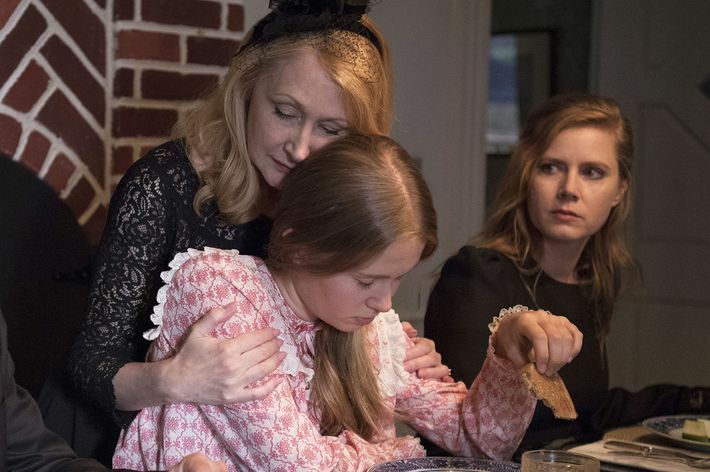 But the story that becomes the most fascinating is the one that unfolds between the women in Camille’s own family as they navigate their generational wounds — her teenage half-sister who carefully hides her rebellion, Amma (Eliza Scanlen), and her brittle, demanding mother, Adora, whom Clarkson plays. Adams has the showier role, but as the show progresses, it’s evident that Clarkson has the trickier one. Clarkson, who is 58, has built a stunning career out of playing complex women, primarily in supporting roles, with each performance feeling more distinctive than the last. But none are as emotionally fractured, and with as deep a sense of a twisted past, as Adora. She’s the kind of character who could easily fall into caricature, a villain whose humanity is constantly obscured. But Clarkson plays her as a contradiction. At times she feels otherworldly, like a ghost transplanted from a fairy tale, the kind of Blanche DuBois character Williams made a career out of creating. In other moments, she’s hard-edged, biting in her cruelty. But Clarkson never forgets Adora’s humanity, even as her actions over the course of the eight-episode mini-series grow more unforgiving. In High Art, Clarkson plays Greta, a former model whose glamour has curdled due to her heroin addiction. Greta has both a lushness and an internal gloom that laces her every movement, qualities that Clarkson has gone on to explore in a number of roles — as the cancer-stricken, uncompromising mother in Pieces of April, who refuses to be a victim, which nabbed her an Academy Award nomination for Best Supporting Actress; as an artist unsure of her talents who develops an addiction to Vicodin for seven episodes in HBO’s Six Feet Under, which earned her two Emmy awards; as Mrs. Kendal in the 2014 Broadway production of The Elephant Man, for which she was nominated for a Tony; and as the pointedly vindictive Vera in Dogville. Her upcoming film, Out of Blue, a noir directed by Carol Morley, sees her in a completely different dimension: The sole leading role, Clarkson appears in every scene as a rough-hewn detective devoid of the femininity that often colors many of Clarkson’s characters. As Clarkson relaxes back into her more natural stance and her flat, New Orleanian accent, what strikes me is her uncanny ability to inhabit the physical and vocal stylings of others within the span of a single sentence. At one point, as we discussed our shared southern upbringings and how she figured out Adora’s voice, she pivoted from the deep, clipped rhythm of New Orleans’s Garden District, an accent that is dying off, to the slow Alabama roil of her aunt to her own grandmother’s accent, which speaks to her Virginian and Georgian upbringing. She isn’t transformative in the traditional sense that we expect of actors. She doesn’t gain or lose weight in a dramatic fashion. Her changes are more provocative and revealing — the way she takes up space in a room, her manner of speaking, whether she faces someone’s gaze head-on or demurs. “As actors, we can only create so much,” Clarkson says of her own process. “At a certain point our own heart, our own blood, has to be there in the scene. The best parts of Adora are my grandmother; the worst parts just have to come from the blackness in my soul,” she adds, letting out her signature velvet laugh. “The body never lies” is a phrase Clarkson picked up from her movement teacher at Yale Drama School. Back then, she didn’t understand the gravity of the statement, but it’s become a personal philosophy for her. It’s evident both in her work and natural aura. She’s a woman who speaks eloquently with her physical form. She’s able to be fully present, to sweep you up in her emotions with a throaty laugh and a honeyed smile, and convey the depth of her emotional life with a simple, beguiling gaze. It’s hard at first glance to find a through line in her greatest works. It only occurred to me during our second time speaking, when I found her leaning against her building. Decked casually in all black, her hair loosely put up, her quiet dog Isadora Duncan by her side. It felt different than when she’d greeted me during our first visit, wearing a white button-up dotted with color, a black skirt swishing at her hips, her radiant blonde hair in soft waves. I felt like I’d stumbled in on a private moment, the bawdy incandescence gone, replaced with a quiet reflectiveness. Perhaps this is what her best performances share. The suggestion that these women have hidden grooves and corners to their personalities, secrets they refuse to share.